Selecting competitive teambuilding exercises is a tricky business. think that teams benefit from fostering competition between the members of the team. While this can certainly be true for some teams and situations, most often, organizations actually suffer when the word “team” automatically signifies “competition.” While competitive teambuilding activities can have certain benefits such as motivation and camaraderie, an overemphasis on competition can prove detrimental to the bonds between members of a team if not managed well by its members. To make things even more challenging, many teambuilding providers have capitalized on this over-simplified version of team competition, and have marketed activities that foster highly competitive events as a tool for team development. 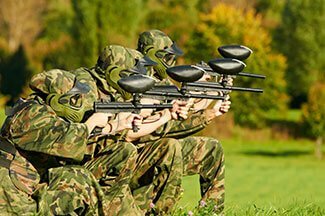 While activities such as paintball, laser tag and wacky olympics might be fun and energizing, they seldom enhance communication and problem-solving skills or lead to improvement in team dynamics or greater buy-in from team members. Here are a few things to remember when introducing competition during a teambuilding exercise. Be certain of the goal of your competitive teambuilding event. If you are simply checking off a box for team fun out of the office, then maybe a competitive activity will fit the bill. But if you are looking to build a sense of team unity and cohesion, you might not want to pit one group against another! Emphasize external competition. When individuals are focused on competition with their peers, and winning above all, they seldom stop to think of the other people in their team. If, however, the team is facing an external opponent, they are often motivated and energized to work together as effectively as possible. Facilitate a discussion around team dynamics. Be sure to get feedback from participants around the pros and cons of the competitive element, rather than simply playing the game. Competition without some sort of coaching and conversation misses the point of teambuilding. How to make competition beneficial. Many individuals see competition as a motivator to do their best for the team. With this in mind, competitive activities can be tailored to maximize the motivation and minimize the potential for negative outcomes. Compete against time, rather than against one another. If teams are focused on improving their overall time, there is less “us vs. them” mentality. You could also have two or more teams sharing information that improves the overall time. When teams focus on collaboration, rather than competition, they usually achieve more and improve both the time and the project. Have the team(s) compete against a facilitator. When teams are competing against external opposition, they are more likely to combine resources toward the common goal. De-emphasize athletics in competition. Opt for a problem-solving exercise, rather than activities that rely on physical strength or speed. Facilitate a discussion around the benefits and detriments of competition in the workplace. Often there are strong feelings attached to competition, and the more the team understands the individuals within the group, the more likely they are to work together effectively. Competition can help teams to focus their effort and their ideas on achieving a group goal. But competition for its own sake is seldom the best choice for building teams. Sometimes digging a little deeper into what you are trying to accomplish leads to other options for a teambuilding event, and competition becomes just one of the tools for accomplishing the goals of the team.